Donovan bought his distinctive red Gibson J-45 guitar in July 1965, during his visit to the Newport Folk Festival. With this guitar he recorded all his 60's unforgettable albums and played his songs around the world for years. 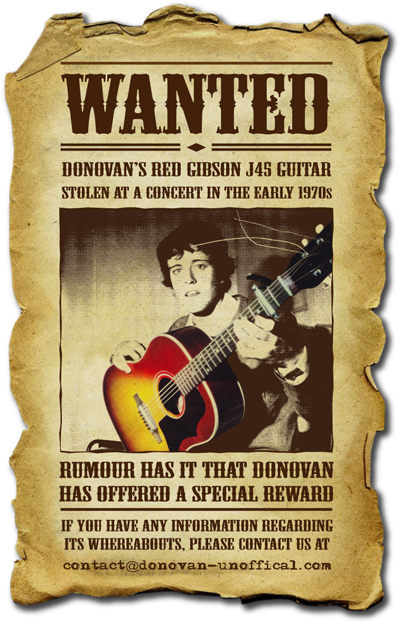 But it was stolen at a concert hall in the early 70s and now, almost 40 years later, Donovan is still looking for his old guitar. If you have any information regarding its whereabouts, rumour has it that Donovan himself has offered a special reward! He doesn't mind who stole it: we've heard he will forgive the person who took it. Donovan just would like to recover his guitar and keep creating music with it.